Maintaining active accounts, responding tactfully to criticism, and engaging users on their favorite social media platforms all go a long way in building relationships with your community and drawing in new customers. Still, unless you’re also investing marketing dollars into paid social media marketing for restaurants, you’re likely missing out on a good deal of business. If you’re intimidated by the thought of sinking money into paid social media ads, relax. Restaurant social media marketing isn’t as complicated as it might seem – and it works. Facebook didn’t become more valuable than Exxon by relying on intuition to decide where to place ads. The ad-targeting methods it and the other social media giants use are based on highly-sophisticated computer and social science. Setting up an effective campaign can be as simple as providing an image or a message to promote, along with a few details about your target audience and business goals. The same is true of all popular social media sites. Instagram was acquired by Facebook in 2012 and has since grown to 500 million monthly active users. It also now shares Facebook’s ad platform, making it easy for business owners to reach users of both services. Twitter, another social media juggernaut, allows advertisers to target users based on the same criteria as Facebook, including age, gender, location, and interests. Follow these tips to make the most of your social media advertising campaigns. Social media services provide you, the business owner who wants to reach customers, several ways to hone in on your target market to ensure you’re not wasting resources displaying ads to customers who are unlikely to pay a visit. Age may play a part in determining whom you’ll want to see your ads. If you’re an upscale dining destination that serves an older demographic, you can set your ads to only show up to them. Clubs that target younger adults can set ads to target individuals under 30. You can choose to display your ads to one specific gender, as well. If you’re advertising a “Girls’ Night Out” deal, it’s possible to set that campaign to target only women. A combination of gender- and age-specific criteria will allow you to narrow your target audience even further. Another powerful marketing strategy for restaurants is to hone in on customers’ specific interests. If you have an idea of what your guests like to do in their free time, that knowledge can go a long way in getting your message to them. If your eatery is near a golf course, consider setting your ads to appear to people in your area who are interested in playing golf. Sports bars will benefit from serving ads to customers who show allegiance to the popular sports teams in their areas. If being a family-friendly place to eat is part of your brand, you may consider showing your ads to people who express an interest in visiting local family attractions. To avoid wasting advertising dollars on folks who live nowhere near your restaurant, set your advertising campaigns to only display ads to people who are physically in your area. Ads can target segments as large as a whole country down to the zip-code level. You can even set them to display only to people who are in the immediate vicinity of your restaurant, helping to attract tourists or people shopping and working near your business. 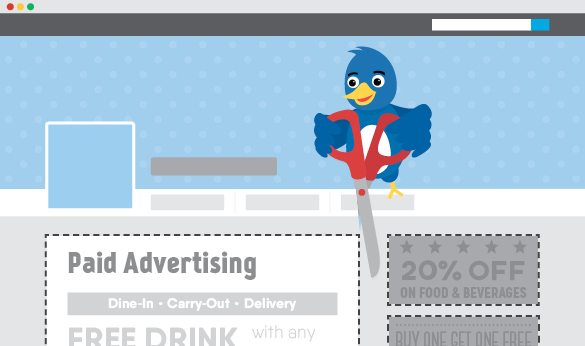 Advertising that your restaurant exists and that you have tasty food is one thing, but a great way to offer an incentive for customers to actually visit your business is to post coupons for discounts and free items on your social media pages. Both Facebook and Twitter allow customers to run campaigns that are specifically intended to encourage guests to redeem such offers. Social media marketing for restaurants should go beyond simply convincing people to buy your products. Companies can establish brand recognition and trust with their customers by offering content that entertains, inspires, or informs. Consider posting on topics that celebrate your local community. Mixing your ads with feel-good content can be a reliable way to give back and establish trust with potential customers. A dedicated festival-goer, Tanner West has seen more bands perform live in the middle of hay fields and city parks than most people have probably heard of. Raised on beans and taters, he recently renovated a home and three vintage sheds in the back woods of East Tennessee that serves as a quiet retreat for reading and ready base for hiking and camping trips. Despite being able to craft 500-word descriptions of restaurant equipment, Tanner is a man of few words who described the best meal he ever ate in one word: Coffee.